▷ ⚡️ Chiapas ⚡️ Its nature will leave you speechless ↑ Are you ready? There are many places in the world that have natural settings that seem to have been taken from a fantasy story due to their great beauty, but there are very few destinations that have more than one of these types of places that you don´t get tired of admiring them and photograph them. Flights to Chiapas, precisely offers you one of the most privileged places in Mexico for its wealth of beautiful places. This place is an imposing opening in the earth from which also flows the impressive Grijalva River, which is the second largest in the country, which is navigated by boats to admire the richness of the flora and fauna of this natural area. The precipices of the Canyon have a height of up to one kilometer in some sectors, and along its extension, there are viewpoints to observe its majesty. This is an abyss 140 meters deep and 160 meters in diameter, located near the Chiapaneca community of Piedra Parada; it is home to hundreds of thousands of noisy parrots that flock in flocks since dawn. Sportsmen who go to practice various sports of ascent and descent frequent this natural area. The Tulijá River thanks to its abundant stream of carbonated water forms these waterfalls, this place offers a beautiful blue coloration, which is produced thanks to the solar rays on the particles found in the water, without a doubt a show worth knowing and admiring. This is an immense natural reserve of 331 thousand hectares located in the Lacandon Jungle; it has jungle, forests, valleys, plateaus and a lot of water, provided mainly by the Usumacinta, Lacantún, Lacanjá and Jataté rivers. 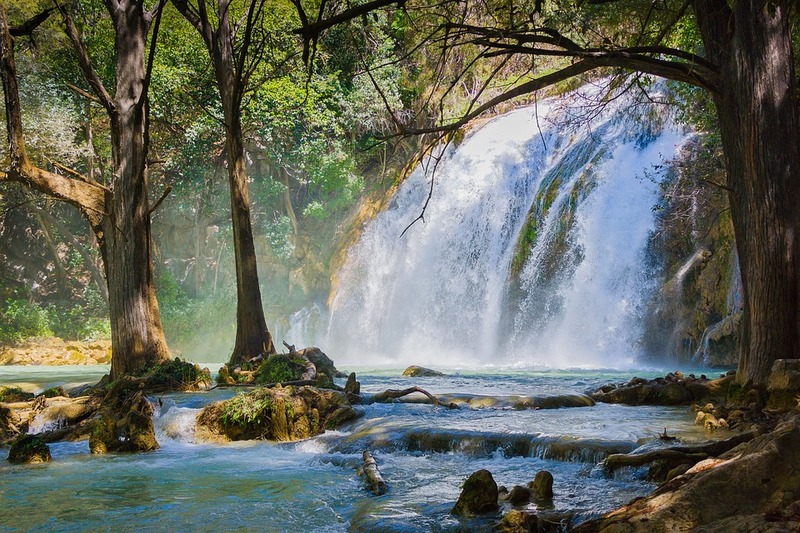 The diversity of its flora and fauna is among the richest in Mexico, and in the jungle live species at risk of extinction such as the jaguar, the harpy eagle and the scarlet macaw. Puerto Arista is a small fishing town located on the Pacific coast of Chiapas, which has a beautiful beach with magnificent waves for surfing. The tourist infrastructure of Puerto Arista is very simple, so it is an ideal destination for people who love the simplicity of life and not their luxuries. In Puerto Arista, you will be guaranteed tranquility and a delicious meal with the fresh fish and seafood that fishermen take from the ocean. This beautiful ecosystem of coastal marshes and sustainable ecotourism center is located 45 km from the small city of Tonala Chiapaneca. It is an almost virgin site, rich in fauna and flora characteristic of the marshes near the sea, the center has cozy cabins with a construction that integrates them perfectly to the environment. 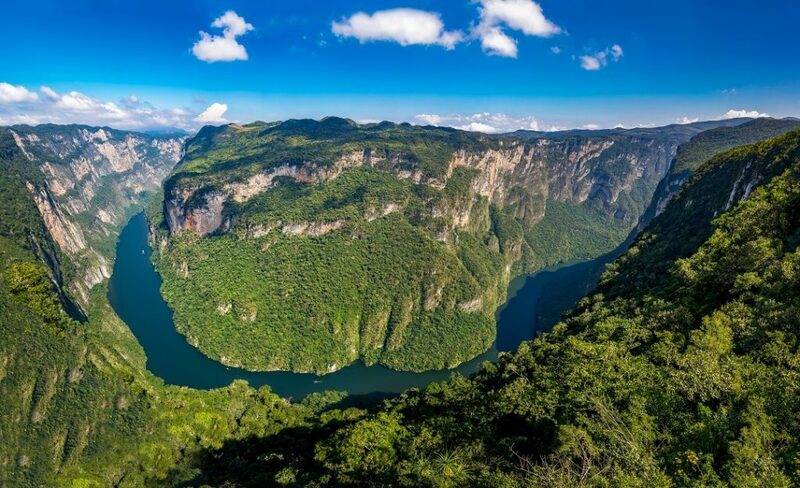 Don´t miss these and more places full of natural beauty when you take one of the flights to Chiapas, which without a doubt is a destination that will leave you surprised by all the nature that surrounds it and is worthy of admiring and photographing.